Most people think of ornaments as being for Christmas (most of mine are! 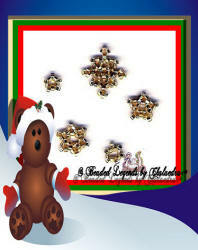 ), but I have ornaments, decorations, tags, small pendants, etc., listed in the ornament section for all kinds of holidays. Many are also suitable for earrings, etc. Click on any thumbnail below for more information on that pattern, including larger picture, price, description and add to cart buttons for each pattern. All designs are copyrighted 2007-2010 by Charlotte Holley, Beaded Legends by Chalaedra. This includes all web graphics, original jewelry designs, original art and writing content. All guest designs displayed on the guest pages are the copyrighted property of the designer who created them and are protected under the copyright laws of the United States of America. For information about licensing or any other comments, questions or suggestions, please contact: Chalaedra@BeadedLegends.com. Chalaedra and her logos are trademarks of Beaded Legends by Chalaedra.